Sequel to Whatever Happened To Penny Candy? The hidden force affecting your business, career and investments, and what you can do about it. During the 1980s, the velocity of the circulation of the dollar became erratic; now the whole country is affected. Why Federal Reserve officials remain so afraid of inflation. The financial trigger. Precautions you should take. Not one analyst in a thousand understands what velocity is doing to us, but you will. 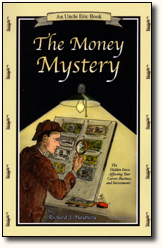 Originally titled The Velocity Mystery.